The ongoing Istanbul Design Biennial (October 13th 2012 – December 12th 2012) builds on two complementary ideas – Imperfection and Adhocracy. Adhocracy, a term coined by seventies sociological futurist Alvin Toffler, critiques the idea of Bureaucracy by posing as its counter-point. It becomes a set of processes functioning without the mediation of heavy handed rules and regulations. 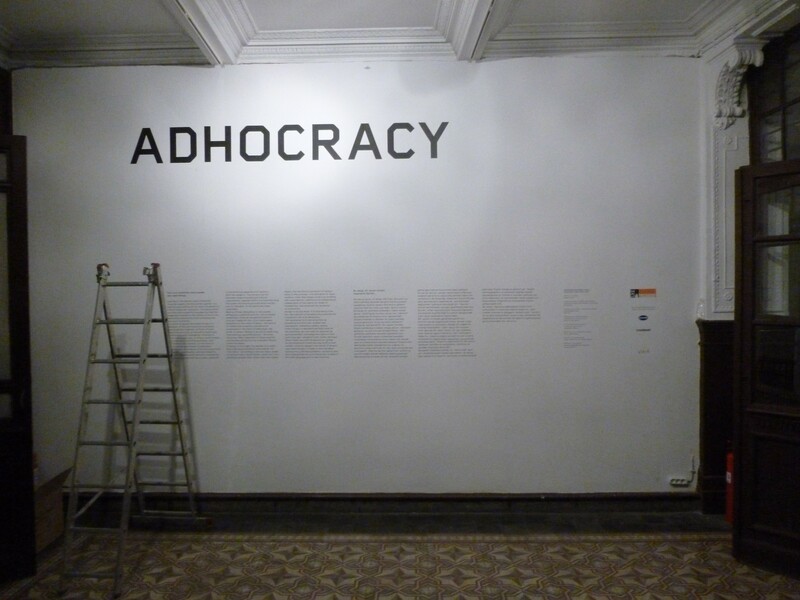 Curator Joseph Grima, who invited us to be part of his Adhocracy section of the exhibition, took over this concept. ‘If design is no longer the domain of a select few creating products of consumption for “the many”, according to the top-down model of bureaucratic industrialism, what is it? This exhibition argues that rather than the closed object, the maximum expression of design today is the process—the activation of open systems, tools that shape society by enabling self-organisation, platforms of collaboration independent of the capitalist model of competition, and empowering networks of production. Design is on the move: it is migrating from the rigid domain of bureaucracy towards the rhizomatic realm of adhocracy’. As we used this concept to reflect on our work, drawing from a range of experiences based largely in Mumbai, Adhocracy became an increasingly useful concept. For long we have questioned the idea of using euphemisms like ‘informal’ to understand so-called ’slum’ settlements in the city. Or to refer to its economy with the same label. Over the years we realised that bureaucratic and conceptual confusion was at the heart of the matter. In fact the overwhelming overlap of processes between the apparently formal and the supposedly informal became something difficult to ignore. When urban planning gets taken over by bureaucratic procedures they get expressed most strongly in zonal, spatial, temporal and structural regulations. Consequently, it is easy to label anything that slips in between them as ‘informal’. Yet, unplanned urban regimes in cities such as Mumbai, remain functional, economically productive, domesticated or industrial and contribute substantially to the city. What makes them so? What are the adhocratic processes and structures that they rely on to exist and persist? The tool-house for us represents one such process-structure. It is a concrete manifestation of adhocracy in the realm of urban living. It combines working and living conditions, it plays around with time and space, is domestic and work-centered and in many homegrown neighbourhoods in Mumbai, is ubiquitous. It also emerges from a history connected to artisanship. However, as part of contemporary urban life, it takes the idea of artisanship and craftsmanship into a realm that combines new technologies and economic needs, labour and energy systems to become a firm part of the future of uses, needs and objects. It allows us to see through the exaggerated claims of capitalism in the world of production and its relations with technology and labour. It forces us instead to look more carefully at what constitutes these processes. If for a moment, the tool-house is idealized, just so that we can get a glimpse of its possibilities in a world run by adhocratic principles, we step into another kind of a city. Where regulations are not imposed through a bureaucracy but emerge through practice. And a practice that somehow addresses modern values more effectively rather than merely through rhetoric. For one part of our installation at the Istanbul Design Biennial, we asked Mumbai’s wood carvers to make tool-houses in an idealized form. The suggestions to them were on purpose vague and unclear. This was done in order to find out a moment in their discourse, which would let them reflect on and play with their skills in a freer way. Their responses were a combination of enthusiasm and irony. ‘If only tool-houses existed like this – as dignified spaces’ was their wistful, common refrain. Everyone knew that what was being produced was a fantasy. At the same time, in their conception of the object, there were traces of both memory and contemporary perception. 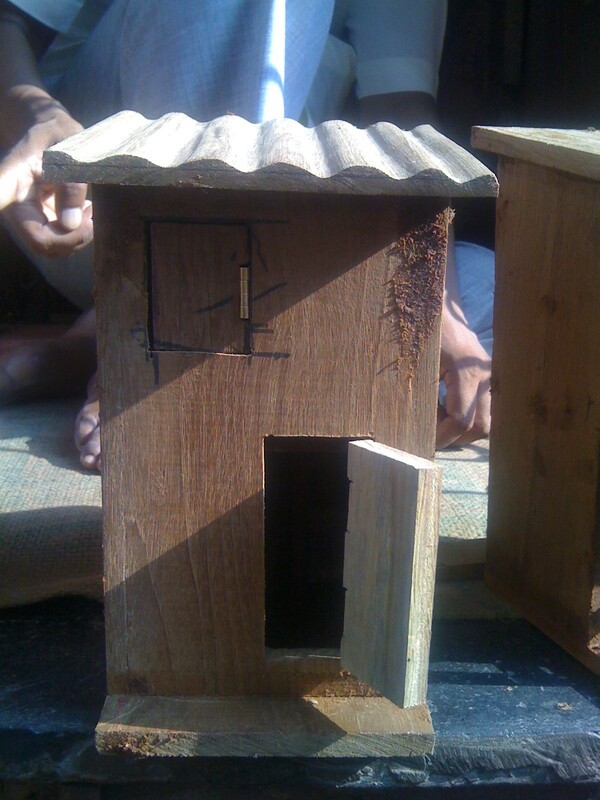 One carpenter wanted us to film the process of making a model of the tool-house in two hours flat. This became part of the video that accompanies the installation. 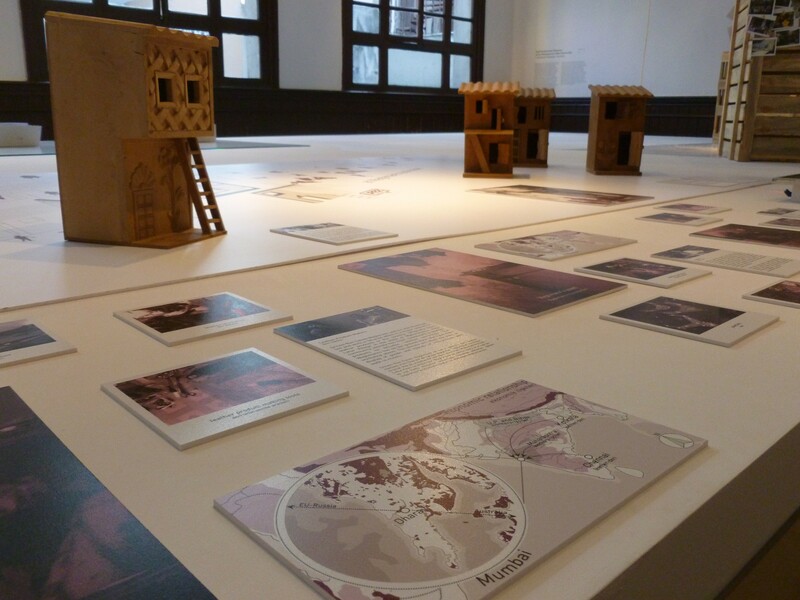 The little wooden structures made by wood-carvers framed the larger story of the 5 narratives that make up our installation. The tool house is the context in which all the different stories of artisanship unfold and acts as a common element linking people to the urban form. 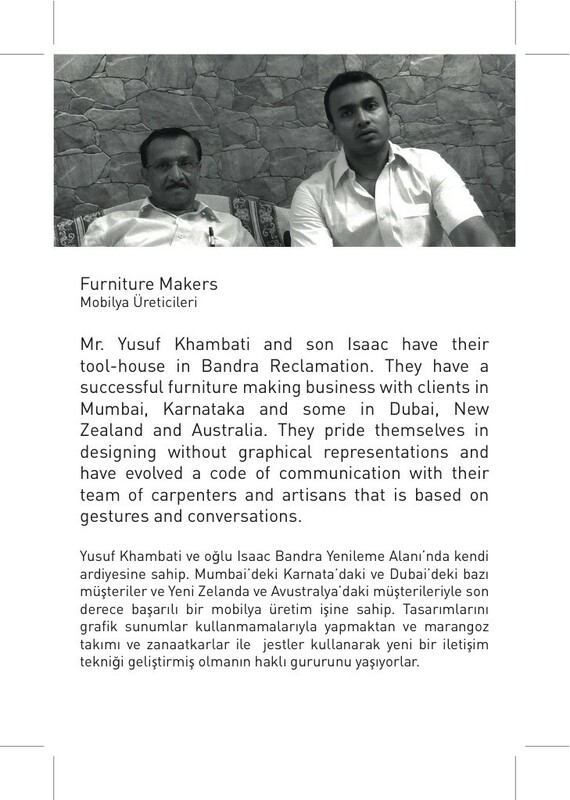 The first 4 protagonists include a furniture maker, shrine maker, artificial jewellery maker and leather-product maker. The many layers of meaning that involve social history, caste, spatial politics and productivity have to be read and re-read in their simple narratives that encompass the movement of goods, specialization of skills, the presence of the tool-house and so many other factors that make up their lives. Multiply these a hundred thousand times and you see Mumbai in a more accurate way. What struck us was that the process of designing itself was adhocratic – emerging through conversations, references, oral exchanges and gestures. This was a frequent observation we made when dealing with our fifth artisan in the installation – the ‘Contractor’ or the maker of tool-houses. The contractor shapes neighbourhoods brick by brick quite literally. Each peculiar desire of a client gets a concrete form. The leather using artisan may want a slightly different kind of a workshop over his residence compared to a furniture maker. The adhocratic processes that make up clusters of tool-houses in a Mumbai neighbourhood run on their own rules and regulations. Their design emerges in a similar way. A hurried sketch, an activation of common memory through a gesture and a word are some components of unmediated design.